The iron gym should work for you. I do believe it left some black marks on my door frame though, so you may have to touch it up with paint or maybe try removing the marks with a magic eraser before you move out. Make sure you measure your door frame width before you buy the type that doesn't screw in. Also, if you have an old house like me, make sure that you don't have the high mouldings over the door frame or the no screw type won't latch properly and you'll have to return it. I purchased one from Wal-mart. I think it is made by Gold's Gym. It was only $20. It does not attach permanently and I remove it after each time I use it. It works great for my P90x workouts. I have the Iron Gym one and it has no screws, I didn't trust it at first but it holds me just fine, I still hate it though ha ha. Rena - Ideally, a pull up bar that screws into place is the better option, but i cannot be making any holes, or damaging any walls, which is why im considering getting the non attached one. I like casall it is a screw in bar that tightens into place. I don't like the thought of hook on- swing to violently and bang you lay on the floor.. Mine takes ages to screw loss and I need a knife to loosen the cups each end lol..
html I like the form it avoids hard skin on the palms..
Good question! I'd been thinking about getting one too and was never sure how secure they were. I might look into the over-the-door-frame model. That looks pretty close to the one that I have. No screws or permanent attachments to the doorway. I take it down when I'm not using it. It works pretty well for regular hanging pull-ups and chin-ups. I don't feel comfortable getting too crazy with it doing things like CrossFit kipping pull-ups. But, it isn't bad at all for the investment. good info! 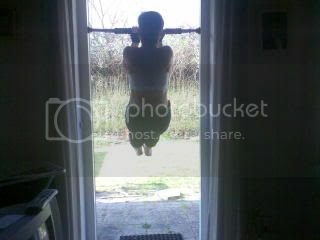 i was looking on investing in a pull up bar! I have one from Creative Fitness. I've seen one at Wal Mart that just hooks around the door frame, but I have not tried it. Good luck with your search! The Iron Gym doesn't screw in. It's not like a curtain rod either. I don't think I can explain well. It just hooks across the door frame in both directions. I love mine, use it every other day or so and haven't had a problem with it, so I recommend it for the casual pull up person. If you're going to be cranking out thousands over the course of a year, I'd go with something screw in, but for most people, the Iron Gym should be fine. I think they are about $20-30 at Target for the basic model. I'm pretty sure there isn't a pullup bar that doesn't involve screws. If it was held on by pure tension, like a shower curtain rod, it would easily slide down whenever it's used. So mad at myself for not exercising today!